My "little" brother, who's been taller than me since he was in the 8th grade, I'm sure, turns 30 today (I have no idea how that's possible since I'm still 29, but I digress). I couldn't ask for a better brother, sure am glad he married such a wonderful wife, and love that he's becoming more of a doting Uncle by the day. Happy birthday Michael!! Meeting Anna ... pretty sure this is the first time he'd ever held a baby! Miss Independent can now eat bananas on her own, thank you very much. Also, she'd like to go outside to enjoy her healthy snack. NOW! a love for jumping + a love for counting + warm weather + sidewalk chalk = HOPSCOTCH!! I can’t believe this is your last letter before you turn two years old! You seem so grown-up and mature some days and then other days I look at you and can only see the baby girl that came home with me from the hospital just days ago. I’m slightly obsessed with you and all that you do and I’m cherishing every minute of this maternity leave where we get to spend extra time together. You've grown into such a caring, loving, fun, smart, and witty little girl in just 23 short months I can hardly wait to see what you do next. Educationally you seem to be ready to start grade school and I’m in awe each day as you show us a new skill or trick you've learned. You’re working hard on counting and routinely work numbers into your day. It’s hilarious to hear you count along with me and to see you try to work those little fingers makes me smile. You really love to count from two to three, but will occasionally throw in the numbers up to seven. Given your love of counting and jumping, you’re a big fan of hopscotch now that it’s warm enough to get outside and it’s hilarious to watch you “count” your way through the squares. Speaking of, you LOVE to be outside, and we love being out there with you. We've gone on many a walk now that it’s warm out, you’re on the lookout for ducks at the lake in our neighborhood and dogs in yards and when we get home we usually go around back and spend some time on your slide or just running around in circles. One of the hardest parts about being a parent (with slight OCD), for me, is balancing the time spent with you directly and all the other “things” that need to get done so that we can exist as a family; dinner needs to be made, laundry folded, the house cleaned, etc. What I've found recently is that you’re more than willing to help out and I can generally make a game out of even the most mundane tasks and you seem to think it’s fairly awesome. I've started to invite you to pull a stool up to the kitchen island while I cook a meal or chop produce and we turn spinning the salad into a counting game. A “cat hunt” (our take on a bear hunt through the house) can also double as a quick clean up as we march. Just yesterday you helped me deadhead the flowers out front and we raced to see who could get the defunct blooms to trash bag fastest. You love to feel like a “big girl” and generally jump (literally) at the chance to help out. We've even started getting some exercise together with dance parties, stretching / yoga moves, and marching or running around the house. Lately you love to play dress up with headbands, sunglasses, tutus, etc and it’s hilarious to see some of the outfits you concoct. On the flip side, you’re also slightly obsessed with trucks and buses and large vehicles of any sort. We know exactly when the school buses run in the neighborhood and likewise know that it’s in our best interest to ensure you see them as they motor along. I love that you’re turning into a somewhat of a girly-girl, but I also love moments when you scream bloody murder because I won’t let you eat a worm (true story, I seriously thought CPS was on their way) or dig in the mud with your bare hands. You’re extremely interactive and are communicating really well. I love nothing more than walking into a room and hearing “Hi Mommy! !” or “Mommy, Mommy, Mommy” followed by a “conversation” about what you’ve been doing for the five minutes I was away. You repeat everything when you’re paying attention and I love to hear your take on words. Recently you’ve started adding an “ey” to the end of most words ... there’s pizz-ey (pizza), juicy and poppy-sicle to name a few. You still love to read and are starting to memorize your books and read them to yourself, back to us, or to Charlotte; I was amazed when I saw you whiz through “Go Dog Go” the other day. Your mind is a steel trap! You love to play games with both of us, but really love to interact with your Dad on a physical level. I witnessed this first-hand when you initiated a pillow fight in our bed after you woke up from nap yesterday. This is something you and your Dad have done in the basement together in the past, but as of yesterday it was a fair game anytime you were close enough to a pillow that you could lift on your own. I died as you ran through the family room toward your father declaring “piiiilllloooowwww fiiiiiiight!” and bopped him on the head. You’re doing great as a big sister and I can tell that you already have a huge spot in your heart for Baby Charlotte. You always know where her pacifier is and are determined to make sure she has it should she be in need; we’re working on the fact that she doesn't need it when she’s sound asleep or nursing, but it’s the thought that counts. 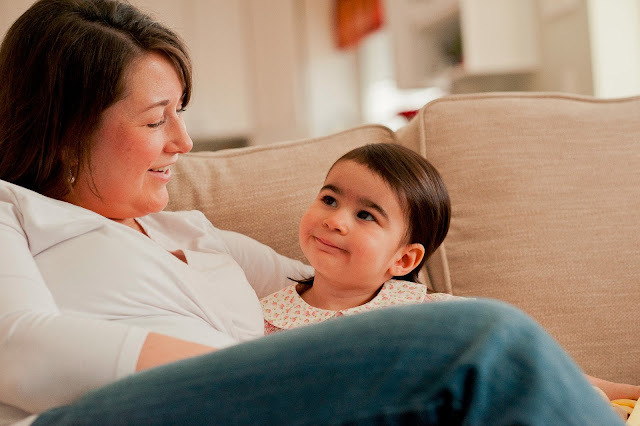 You share your toys with her, help her play with hers (rattles, activity mat, etc) and will ask about / look for her on the rare instances she’s not in the same room as everyone. You’re also continuing to be a great “Mommy” to your stuffed animals and routinely put them to “night night” all around the house. I was cleaning up after you’d left for daycare one day last week and realized that our family room might appear to be a cult experiment gone wrong to a stranger; there were probably 10 stuffed animals laying face down (you didn't get the “back is best” memo) with blankets covering them in various locations throughout the room. I said at the beginning of this letter that I’m obsessed with you and that’s truly the case. You wear me out most days, but I love to hear that little voice when you wake up in the morning or from nap (always SO happy! ), love to see your smile, and I’m constantly trying to plan our next adventure. I read a quote the other day that said “Moms are a promise from God that you’ll have a friend forever” and I hope you always know that’s the case in our relationship. There’s going to come a day when I won’t be the person you’re most excited to see when you walk into a room, when helping me around the house is a chore, and when playing a game with your Mom seems like punishment. But, for now, I’m going to take the love and excitement you show me each and every day and run with it, cherishing our special times and looking forward to all that we still have in store. Thanks to everyone for your kind comments in regard to my post from last week; it means a lot to know that I have such a great network of friends and family in my corner! What a difference a week makes! We're all healthy (fingers crossed!! ), the sun has been shining, temperatures have been climbing, walks have been walked, some weeds have been pulled, flowers have been planted, pictures have been drawn on the sidewalk, bubbles have been blown and the grill has been fired up for the start of BBQ season; for ALL of this, I'm thankful! I can't believe it's time to start this series again! It's hard to believe that less than a year ago I was snapping Anna's last picture and here I am snapping Charlotte's first ... totally crazy! 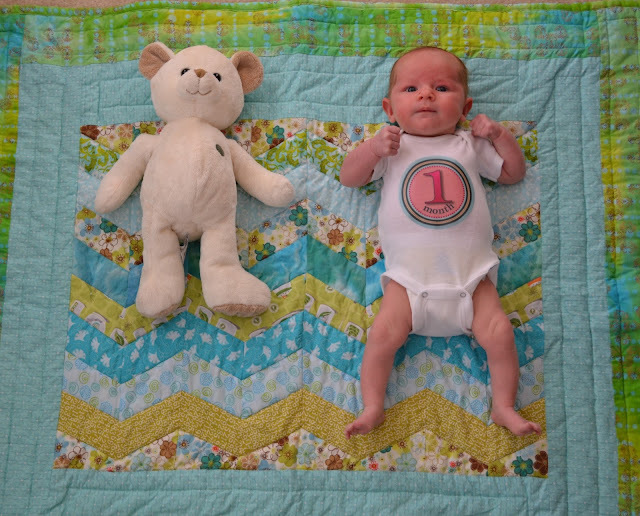 We're using the same bear, but a new blanket; Anna's blanket was made for her by my very talented Aunt Carol and it only seemed fitting that Charlotte should also use her Aunt Carol custom creation. I can't wait to watch Charlotte grow, will she be a string bean like her sister, or will she prove that she's really by daughter my chunking up a little faster? Only time will tell! As a nursing mother, it makes me very happy and proud to see that she's growing so well, and at what feels like lightening speed! 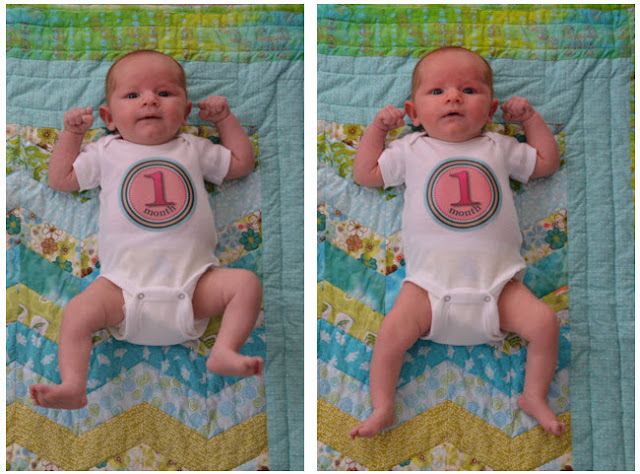 The picture above is the "official" picture for the first month, but I also loved these outtakes, Charlotte has clearly spent too much time with her Dad who has taught her all about showing off her "guns" : ) Work it baby! 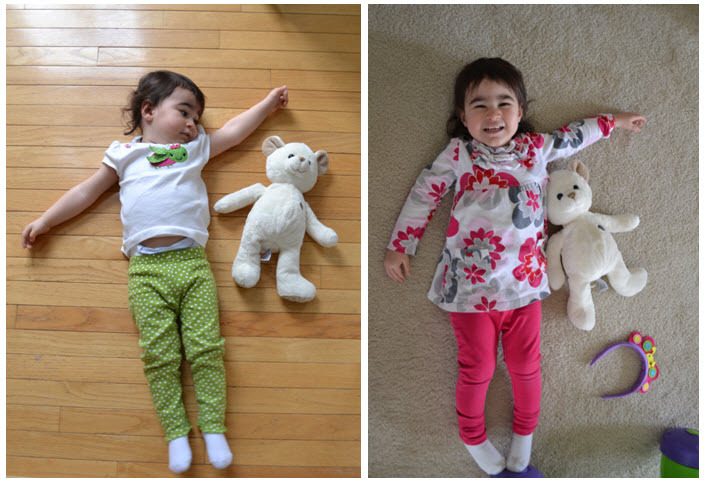 I couldn't help but do a side-by-side of the two girls, although I forgot to shoot in portrait this month, I did size it so that the bear is roughly the same size for an easier comparison. And, not to be outdone ... the day after Charlotte's "shoot" I was reviewing pictures on the camera as Anna looked over my shoulder and identified the subject of each one ... pretty easy when the options are "Anna", "Baby Char" or "Anna AND Baby Char" : ) It just so happened that she'd been playing with "white bear" that afternoon and shortly after I'd put the camera down she positioned the bear next to herself and laid down for a picture, I almost died! And then she did it again yesterday. What a smart and silly girl, she makes me grin from ear to ear! I can’t believe it’s already time to start our letters, what a crazy month it’s been for everyone! I started writing to your sister when she was born and hope to keep up the tradition as long as possible. The truth is that you kiddos seem to grow by leaps and bounds and I love being able to look back and remember all of the fun we've had. And, if the past is any indication, we’re going to be having A LOT of fun! You’re the younger sister and throughout your life you’ll be compared and contrasted to your older sister constantly, and for that I apologize in advance, but sadly, I think it’s simply a fact of life for you. That being said, in just a few short weeks, you've proven to everyone that you are most certainly your own person, have a charismatic personality in the making, and will definitely be giving us a ride for our money. Starting with your looks, you surprised us right out the gate; I never thought it would be possible to have a child with my coloring, but here you are, fair skinned, light haired and absolutely gorgeous. You have delicate, feminine features and I simply can’t wait to see you grow into your own skin. So far you've excelled at everything related to being a baby. You are a super star eater, REALLY excel at peeing and pooping (nothing is more hilarious than seeing your Dad change four of your diapers in a row), love a good nap, and do a wonderful job at making cute baby faces. You’re a squirmy girl and love to make noises, I wish I could say they were sweet little coos, and sometimes they are, but more often than not you’re grunting and stretching with all of your might. The first few nights at home I laid next to you worried that you were about to start wailing as you settled in to sleep after a feeding, but finally I realized those were just you getting nestled in for a long nap. You’re a good sleeper, still bunking with us in your bassinet, but likely ready to spread your wings and head to your “big girl” bed soon. You’re still up to feed every 3-4 hours, but sometimes I think a dirty diaper is the culprit in waking you up. You don’t cry often, and if you do it’s usually because you have a dirty diaper (you REALLY hate a dirty diaper and I guess I can’t blame you), or we’re taking too long to change that dirty diaper, or occasionally you’ll let out a half yelp, half cry to let me know that you’re ready to move onto another activity outside of tummy time or picture time. Everything about you is tiny and perfect and I could sit and stare at you all day long. I’m constantly amazed at how your features are so defined, yet miniature at the same time. I love nothing more than to stare at your little hands as you grab my finger while nursing, or to count your toes and act out “this little piggy” with those adorable feet; we've also been known to get those chicken legs going as we start up a dance party. You have a myriad of little faces that I see at times during the day, my favorite is the half-smile you’ll show after you've finished eating and are settling in for a snooze. You were born about half a pound smaller than your sister, but at your 5-day check-up weighed several ounces more than she did at hers, I can’t wait to see if you grow in a similar fashion, but have to think you may be one to pack on the pounds a little faster given the attention you give to eating. Your sister Anna is one of your biggest fans, although it took her a few days to come around. She tells you hello and goodbye when she enters a room and asks for you if you’re not around. Right now you’re “Baby Char” to her, but she’s working hard on your full name. She’s started sharing her “food” with you and has been known to put on a puppet show for your entertainment, she’s also all over the location of your pacifier and makes sure to always bring it to you if it’s out of arm’s reach. She always gives you a kiss before bed and wishes you “night night” in her sweet little voice. You two will have many ups and downs over the years, but first and foremost you’re going to be best friends and will have each other’s back through thick and thin and I can’t wait to watch this unfold. Right out of the womb the doctor did his initial check, your Dad helped cut your cord and you were then placed on my chest and you stayed there for over an hour while we got to know each other. For the second time in my life I fell in love instantly. And then you peed on me. Twice. As if I tell me who was really boss in this relationship. I remember staring down at you, so proud that I’d given you life and totally in awe that God had put me in charge of now sustaining your life. I was also a little overwhelmed. There’s a lot your Dad and I don’t know about having two girls, heck there’s a lot we don’t know about having one girl, and we’re bound to make mistakes along the way and you’ll question what we’re doing or why we’re making you do things on a routine basis. But then I remembered the one thing I knew you’d never be able to question. Our unconditional love. We loved you the day we found out I was pregnant and that love grows more and more each day, and that love will never falter. You’ll always be my little girl. I don't want to invoke a pity party with this post, but the last four weeks have been four of the craziest, most emotional, and most physically taxing that I can remember in quite a while. It started with Anna sharing a cold with me the weekend before Charlotte arrived; then there was the whole two-day labor and subsequent recovery of birthing a child, including passing several ridiculously-sized blood clots and post-partum hormones; an eye infection that popped up as I'm still dealing with that pesky cold; our toddler came home with a fever that turns into the early stages of a stomach virus that led to projectile vomit and some of the most vile diapers I've ever changed; and over the past five days Mike and I have been dealing with the same stomach virus, and for me, it's on top of the cold that won't die and an eye infection that apparently wants to stick around too. Oh yeah, and we have two kids under the age of two. All of that said, the last four weeks have been some of the most fun, most honest, most humbling, and most rewarding of my life. There's a popular song out right now, Carry On by the group fun; I hear it quite often as HGTV is the background for at least half of my 100 nursing sessions each day (OK, maybe it's not that many, but some days it feels like that) and they're using it in several promotional commercials. When the song came on my iPod yesterday it got me thinking, and because I'm still hormonal it also had me tearing up; things have been crazy with a capital C, but I wouldn't trade it for anything. Not ANYTHING. Instead I'll Carry On and will find the bright side to the cards I've been dealt at the moment. I can't imagine what I'd do with my time if I wasn't thinking about the next nursing session, or checking to see if my shirt has breast-milk or spit-up stains on it before leaving the house, or if we had enough toddler-approved food at home, or if we needed more diapers, or when I may sleep for more than two hours at a time again. OK, maybe I'd take the world's longest nap; but when I woke up, I'd feel lost and alone. At that moment, that song made me realize what a metaphor those two little words were for life in general. Things get crazy, they don't always go as planned, but what a blessing it is to live each and every day, to be able to carry on. So, for now, I'm going to go nurse my little girl who turns one month old this weekend, check my shirt for stains, and if the stars align, we may leave the house and hit up the local coffee shop drive-thru for a smoothie this afternoon. And, for me, today, that's just perfect. ... the reason that I Carry On each day!